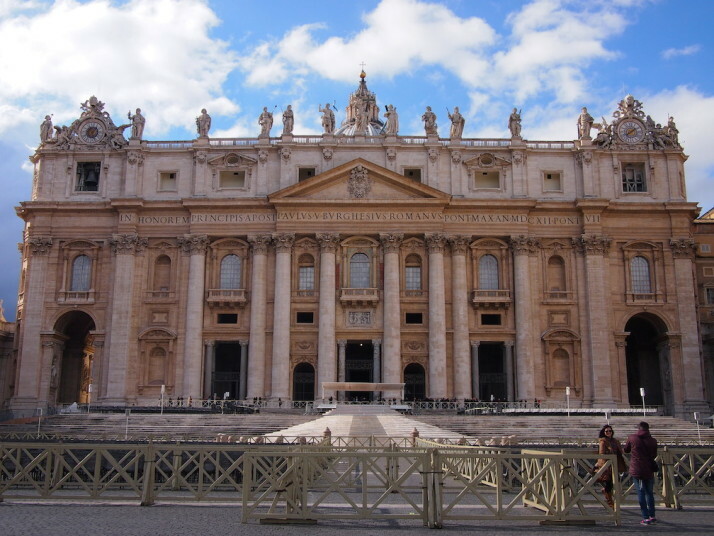 We’ve always wanted to visit the Vatican City. Perhaps because it’s an entirely separate country within a country, the smallest internationally recognised independent state by area and by population, and the centre and focus of the Catholic faith, synonymous with the Pope and with the white smoke of conclave. Or perhaps it’s because of the grandness of the Baroque architectural approach that one cannot help to be enticed. 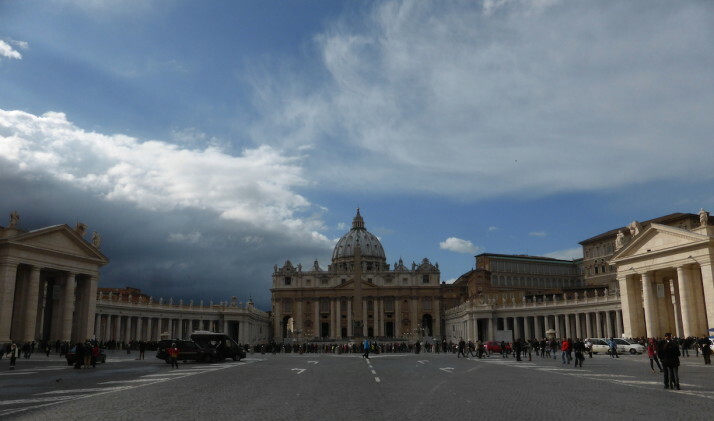 The giant oval cobblestoned plaza of St Peter’s Square simply invites. 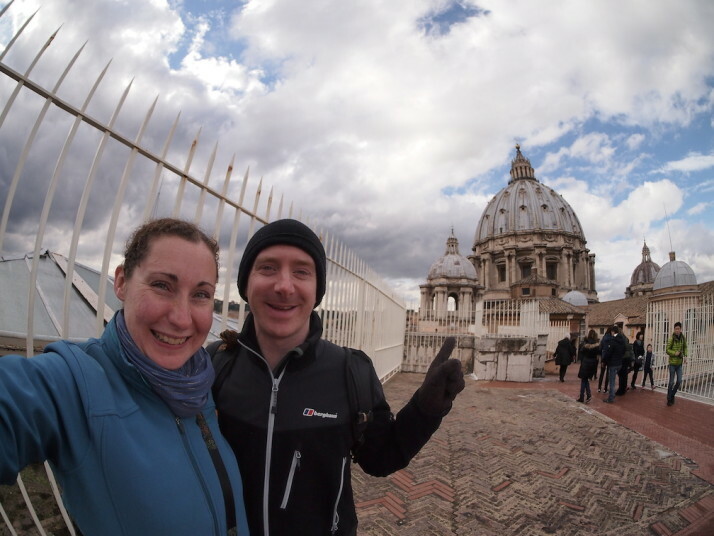 When we stood there we felt safe, surrounded by the giant Tuscan colonnades that block the peripheral vision of distractions, focussing the eye and attention on the staircase to St Peter’s Basilica. 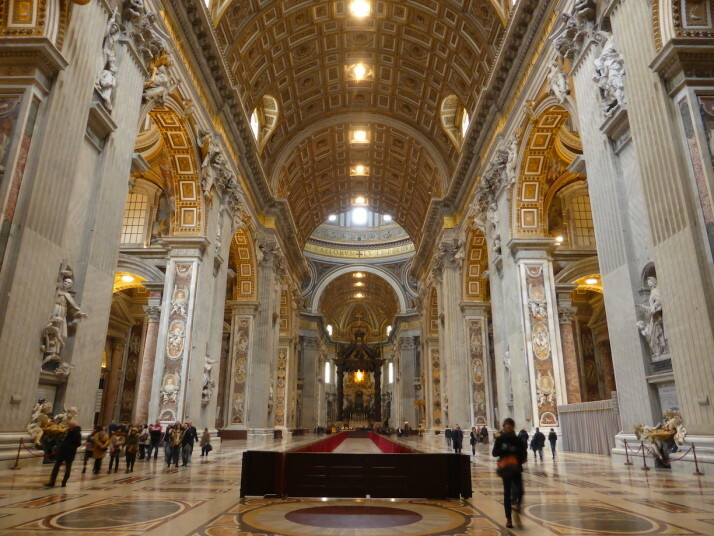 Such was Gian Lorenzo Bernini’s intent – the 4-column-deep colonnades certainly give the feeling of being embraced by “the maternal arms of Mother Church” as he described them. 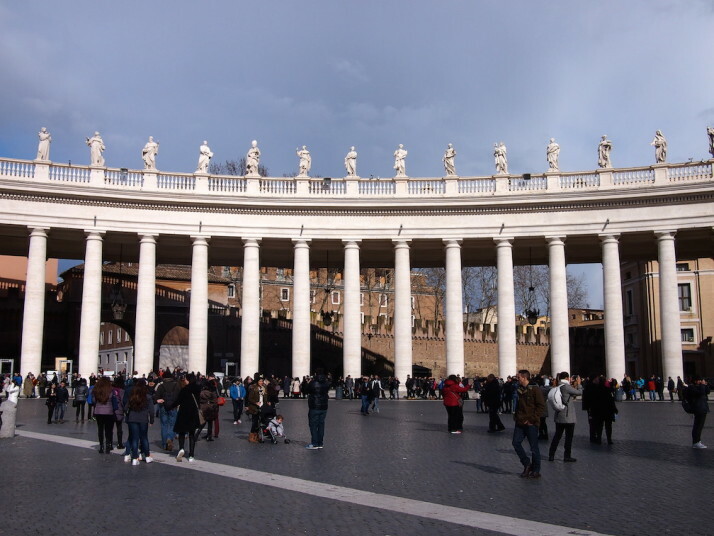 Before it was the site of St Peter’s Basilica, the area outside the early walls of Rome was known as vaticanus ager or “Vatican territory” and was a poor, destitute area. During Caligula’s short 4-year reign as Roman Emperor he started construction of a chariot race course which was finished by his nephew Claudius, but took the name of the subsequent Emperor, Circus of Nero. 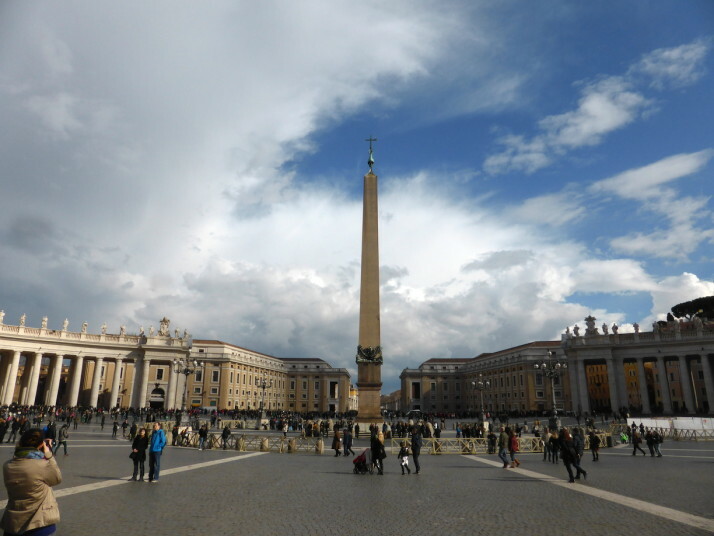 It was Caligula who had the Egyptian obelisk moved from Alexandria to Rome to be the centrepiece and central marker of the race course, and which now sits in the centre of St Peter’s Square. It was during Nero’s brutal games and persecution of early Christians at this circus, next to this Egyptian obelisk that St. Peter was crucified. As we learnt in Pompeii, it was the custom that bodies were buried along the roads outside the towns and cities, and the remains of St. Peter were buried to the north of the circus, on the side of the Vatican hill. 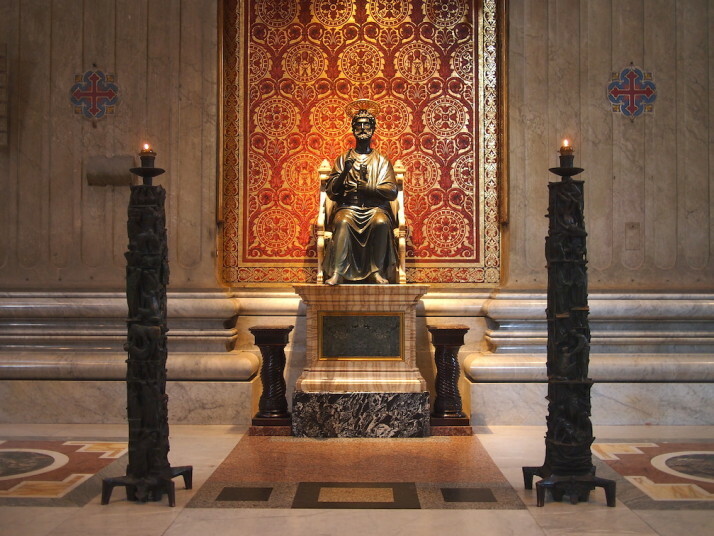 Nearly 250 years later, Rome and Christianity united under the first Christian Emperor Constantine the Great. As well as ordering the construction of the Church of the Holy Sepulchre in Jerusalem where it is believed Jesus was crucified, and the construction of the first St Peter’s Basilica on the site of Peter’s remains, Constantine also built a new imperial residence in Byzantium and renamed the city after himself.. Constantinople. It was to become the capital of the Empire for over a thousand years, and today we know it as Istanbul. We’d read the queues to get into St Peter’s Basilica quickly go from a few minutes to an hour or more, so we saved the square for later and made straight for the entrance. 15 minutes later we were standing in the amazing façade where we also picked up an audioguide. After listening to the enthusiastic audio introduction, we stepped inside what is regarded as the greatest building of its age..
Wow. Our first impressions were every definition and application of splendid – gold and white, marble everywhere, and everything in amazing condition, especially considering its age and the number of visitors it receives. The building itself is a masterwork, both inside and out, and is similarly adorned with priceless works of art in celebration of the faith. Specifically, there were 3 main works we were keen to see up close. 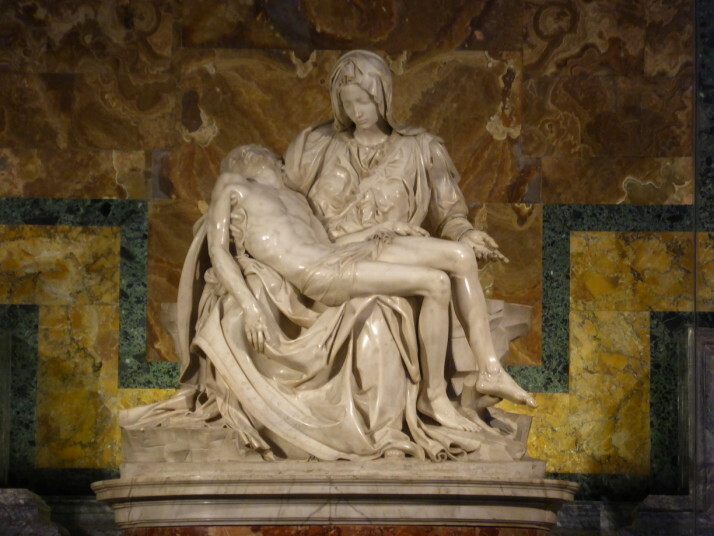 The first, Michelangelo’s Pietà..
.. apparently, rubbing or kissing the feett of St. Peter will curry favour and assist your entry into Heaven, but you’ll have to hurry – there’s not much left of them! As the basilica started to fill up with coach parties and tour groups, we headed down the steps at the foot of the giant statue of St. Andrew into the peaceful grotto below. In this solemn space where 91 previous pontiffs rest in peace, we also saw some of the foundations of the original Constantine basilica. 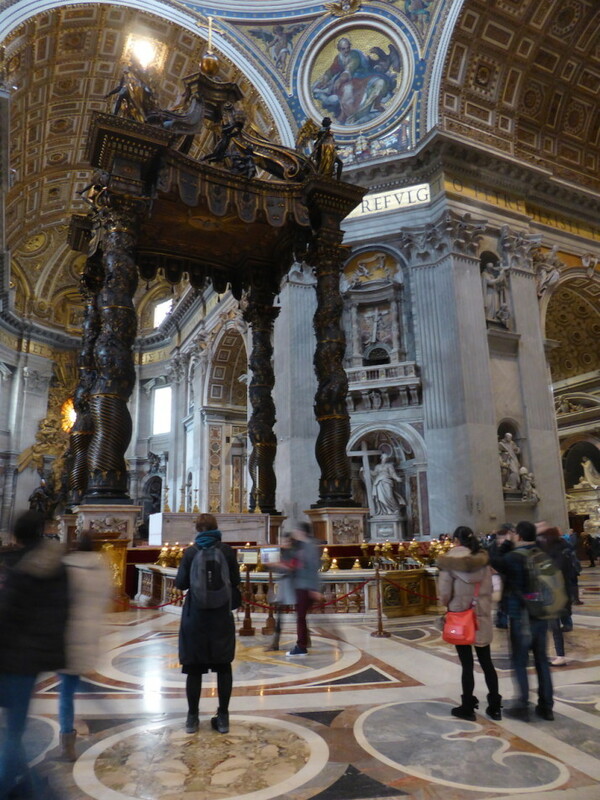 The remains of St. Peter himself are in a separate tomb below this one which it is possible to visit but needs to be booked well in advance. The exit of the catacombs set us neatly at the entrance to the ~500 steps to climb the famous dome atop St. Peter’s Basilica. 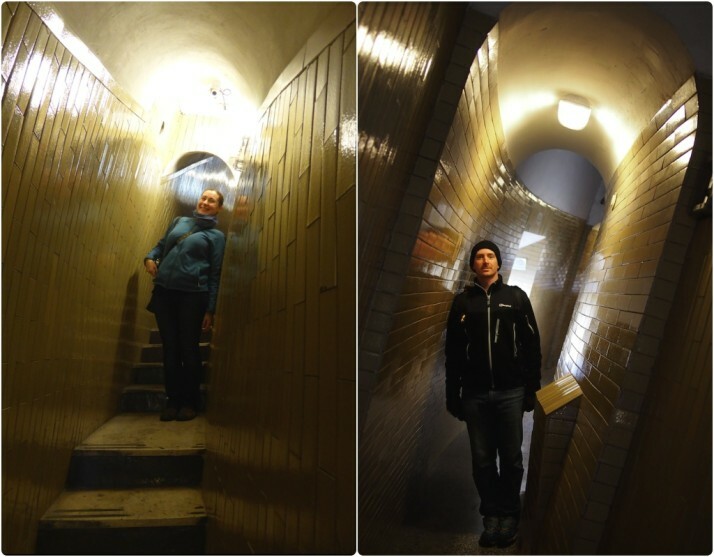 The first 170 or so are optional as there’s a lift that gets you to the roof, but we opted for the stairs all the way. 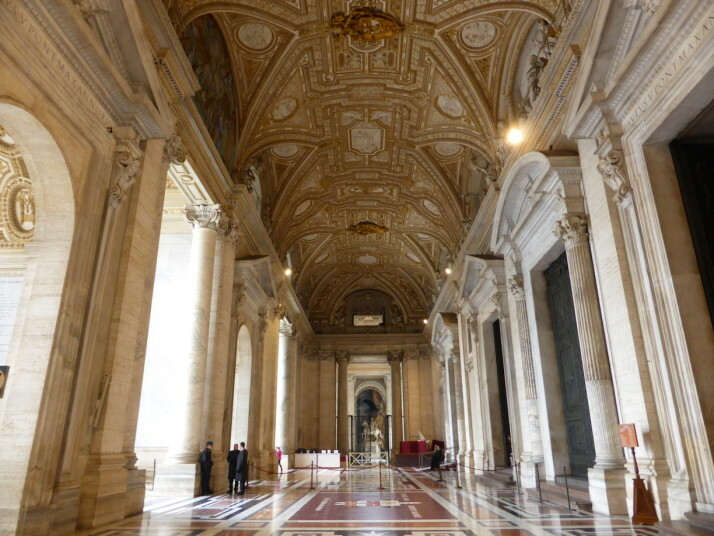 After the roof, we entered the base of the dome and weren’t expecting the view inside St Peter’s..
On exiting the dome we thought we’d just get a view of the square from the roof, but there was more! The stairs started up between the dome’s walls and quickly gained a slant.. The further we ascended, the more the walls curved and leaned with the shape of the dome. And yes, I am standing upright! 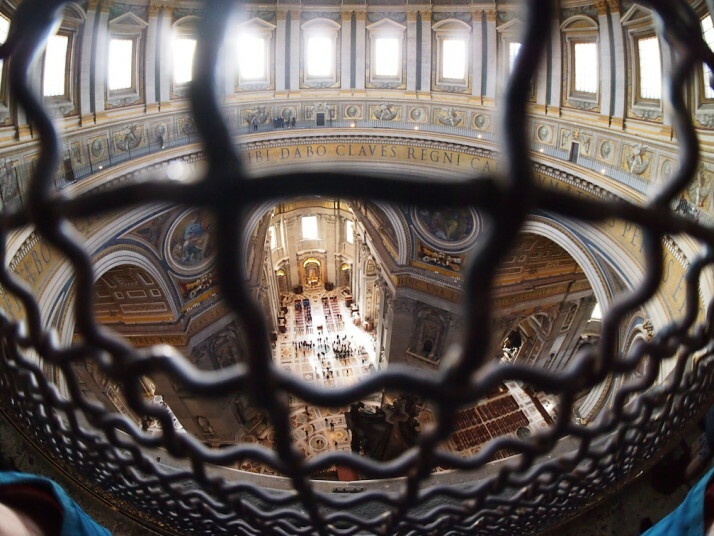 Of the changes to the plans for St. Peter’s Basilica that occurred during the 120 years it took to complete, the giant dome influenced by both the Pantheon and the Cathedral of Saint Mary of the Flower in Florence remained true to Donato Bramante’s initial vision. And the view is certainly worth the climb as you get to stand on the very top! 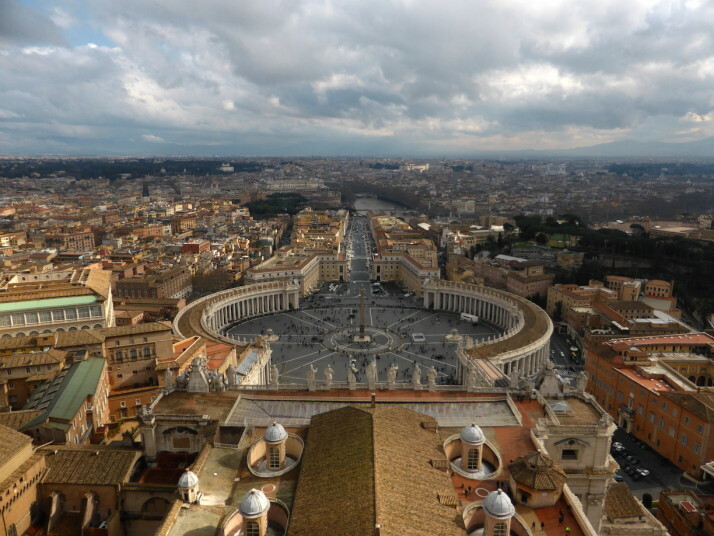 The view from the top of St. Peter’s Basilica of the roof and St Peter’s Square is easily worth the climb – wow! After taking far too many photos of the Vatican from the 360° viewpoint of the dome, we descended back to the roof where we found a gift shop, a Vatican post box and a small cafe, so we stopped for a quick coffee while writing out some postcards for friends and family back home – posted from the roof of the most important church in all of Christendom! 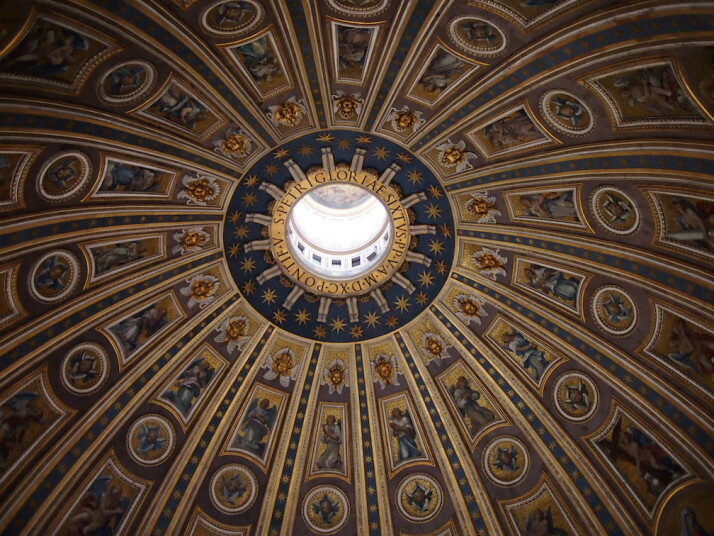 The dome of St. Peter’s Basilica as viewed from the roof – we were just up there! 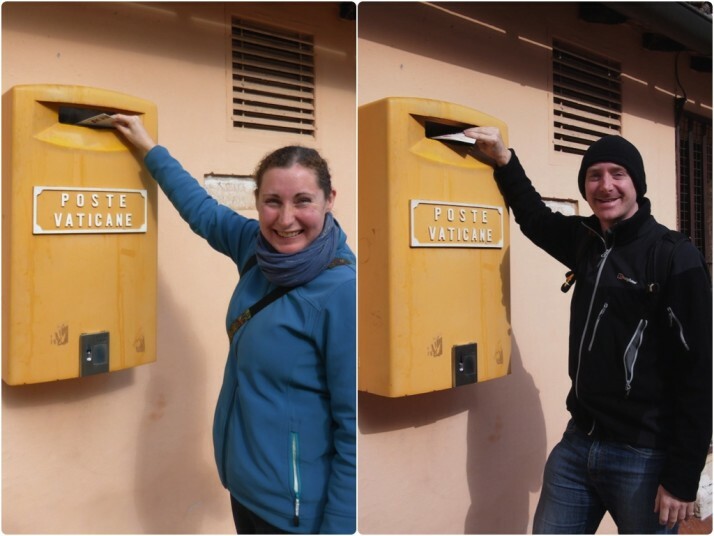 Us sending postcards from the roof of St. Peter’s Basilica! 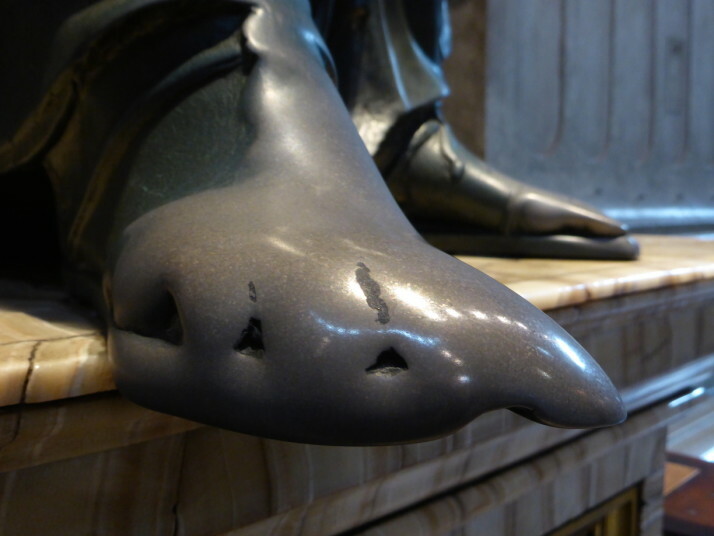 This entry was posted in Places and tagged Church, Italy, Rome, Vatican City on February 19, 2015 by Andrew. And I can confirm it’s a real postbox! :) Thanks for the card, fun to see where it was posted. What an amazing building. Constantine was named emperor in York, you know. Fascinating – nope, we didn’t know that! There’s a statue of him outside the Minster. Really disappointing…. POST CARDS !!!!! why not something in an ENVELOPE ??????? ?